The CookTek PFPD001 FlashPak™ disc fits in a VaporVent™ bag in pizza delivery system. It is designed to keep as many as three pizzas warm for 30 minutes. The disc is made of a temperature-sensing alloy that automatically collects the correct amount of energy from the induction bag charger. This energy is stored and released slowly to hold the pizza at warm temperatures for as long as possible. 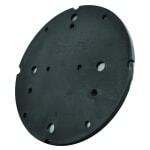 The CookTek PFPD001 disc is virtually unbreakable and can be placed in replacement VaporVent bags. Keeps as many as 3 pizzas warm for 30 min.